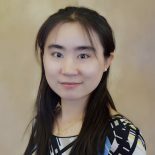 I am Yìchén Christy Zhōu, an Assistant Professor of Economics at Clemson University. My work focuses on environmental regulations, energy policies, and market incentives of technological change. I received my Ph.D. in economics from the University of Maryland at College Park in 2016. Before joining Clemson, I was on leave as a Postdoctoral Fellow at Resources for the Future (RFF) from 2016 and 2017. I grew up in Wuhan and graduated in 2010 from the University of Virginia at Charlottesville with a B.A. in mathematics.